Come Read To Us Day! Have 30 minutes you can spare next Wednesday, April 16th, between 9:00 am and 2:00 pm? 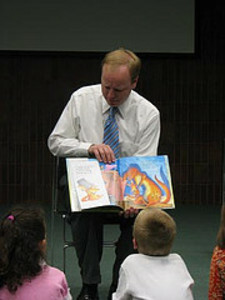 Then come be a guest reader for Brady School's "Come Read to Us!" Day. I'm going to be reading for a Kindergarden class at 9:00. You can pick your own book to bring, or have the teacher provide one for you. I did this last year and it was so cool to see moms, businessmen, government officials and college kids coming to the school to read. It makes a huge statement to the kids that you would take time out of your schedule to spend 30 minutes with them! For more information or to sign up, click here to email Michele Zwart! It's really going to happen! Thanks to a bunch of Community adult and youth volunteers, we are going to offer several weeks of arts classes as part of a VBS/Summer Camp that Wayside Cross is running at Brady this summer. We met with interested volunteers last night, and there are drawers, painters, dancers, cheerleaders, martial artists, and musicians who are super excited to share their talent and passion for the arts with children who don't ordinarily get exposure to that world. One woman actually broke down in tears when she learned that elementary students in East Aurora do not have art class in school. She signed up on the spot, not just to work at the camp this summer, but to be part of an after-school program next year! I have dreamed for a long time of Community 4:12 being able to offer this kind of thing to East Aurora kids, so I am so excited that it is finally going to happen! And I am just humbled more and more every day by people who are excited to give generously of their time and talents and treasures. I had such a fun time at our annual Family Fun Day at Brady Elementary yesterday. It is so much more low-key than our Christmas Gift Mart, so there is more time for just enjoying and connecting with volunteers and people from the community. We had a tremendous response for stuffed Easter Eggs, cupcakes, and volunteers, and Myra Melanson (who was filling in for our usual event planner, Beth, who recently had surgery) did an incredible job of organizing everything and leading the great planning team. So, thank you everyone who contributed!! We tried something new this year and added a Craft Fair to the event. Some of the moms from the community set up booths to sell their homemade crafts and food items. 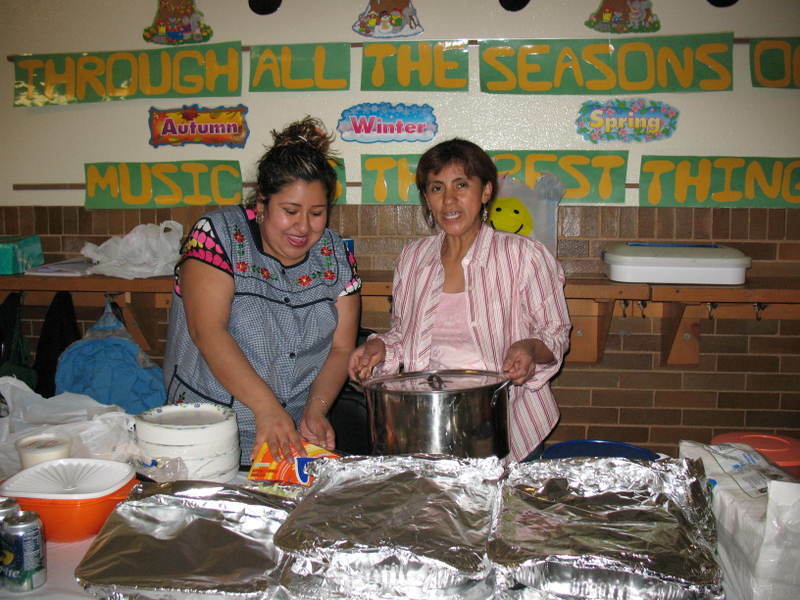 The crafts were a moderate success, but Maria and Marcela's "restaurante" was a HUGE success. These women must have been up all night cooking, but they came in with piles of authentic Mexican food and I am quite sure they sold almost all of it. This will be a definite addition to future events! If you were there yesterday, let me know what you thought of the day! Had a great day yesterday! Started off by visiting our Saturday Stars tutoring program at Bardwell. What terrific and dedicated tutors we have coming to that every week! Then dashed the boys off to their piano lesson at our Montgomery Campus---I LOVE that Community offers School for the Arts lessons, and I am excited about the possibility of starting some SFTA classes in East Aurora--but that's another post. 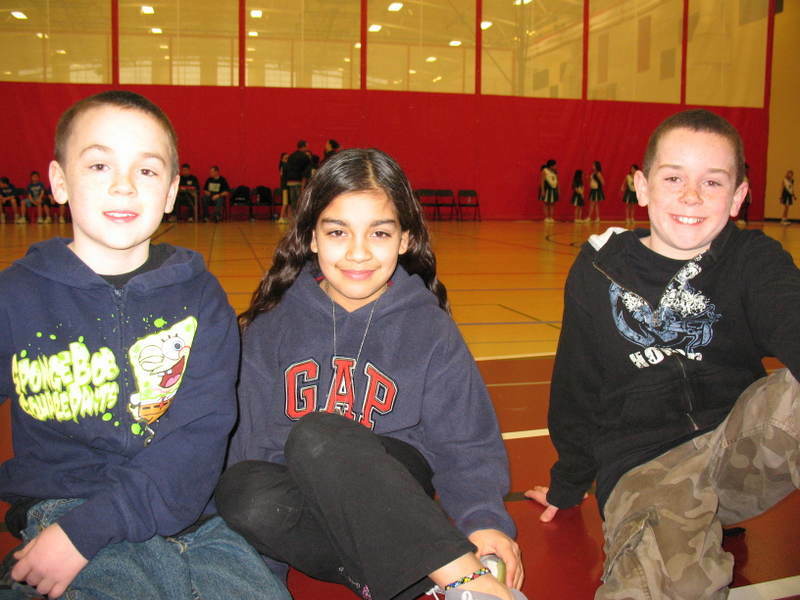 Then we picked up our friend and headed over to East High for the 5th Grade Girls' Basketball Tournament. Triple Threat Sports Mentoring did a terrific job of bringing in volunteers (mostly from our Montgomery Campus) to ref, score, set up kids activities. So, while Scott worked the score board, I got to hang out with kids cheering on our schools. Unfortunately both Brady and Bardwell lost in the early rounds, but it was so fun to see girls from 12 different schools out there doing their best and having fun. Next Sunday is the boys' tournament and girls' cheerleading competition. That is a blast of a day every year, so if you want to come have some fun, come on out from 10:00 - 3:00 at East Aurora High School. And Triple Threat could still use some help that day, so click here and let Caleb know you can help! Left there and went to pick up 2 more neighborhood friends, went to the downtown branch of the library and let each kid pick out 5 books to check out---which they were all eager and excited to do! Then we took them all to our Montgomery Campus for church. After service Steve Kirby led us in a terrific Concert of Prayer for East Aurora. There weren't a ton of people there, but I was so honored that Randy Schoof, pastor at Warehouse Church, and a couple from his church and Obe and Jack Arellano, from CTC, came to spend that time with us. To have them praying for a campus pastor for our East Aurora Campus was just awesome. I know that unity in the church is what makes God smile. I know God is doing a mighty work in East Aurora, and my biggest prayer is that we don't get in His way! 260 volunteers setting up on Friday night. 600 volunteers at the event--at least half of whom were first time Community 4:12 volunteers. 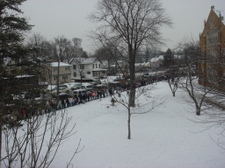 Approximately 3,000 community members attended (the picture shows people lined up around the school to get in). $9,562 raised for Brady and Bardwell Schools. Smiles galore. 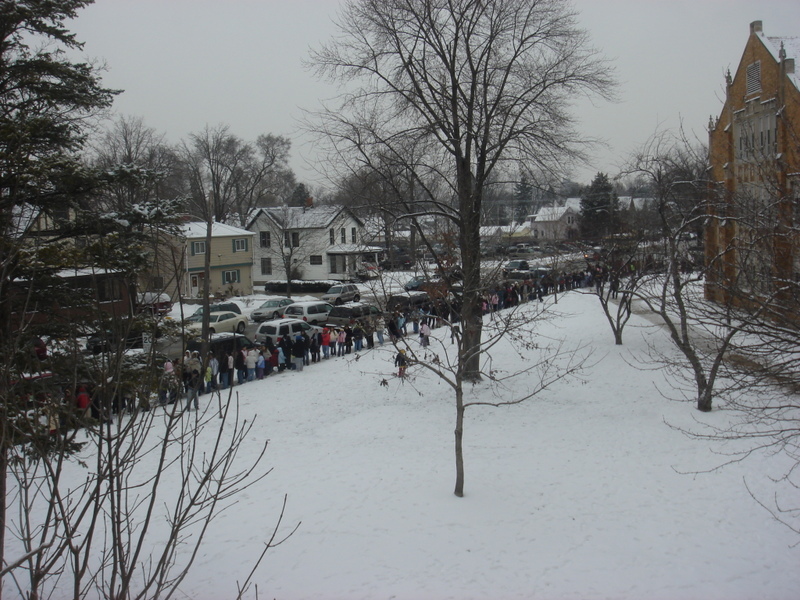 Lines for the prayer rooms (offered for the first time this year by Family and Faith Christian Center). Many unchurched volunteers asking for more information about CCC and service times. More groundwork layed for the planting of our East Aurora Campus to HPFTWBTG! If you attended, leave a comment or send me an email with a story or feedback from the day! And the final count came in tonight at 5,435---exactly 20 more than last year, and a very respectable amount of toys! And we are trusting that it is just the amount God knows we need. That means Tricia will be going to Starbucks on me! 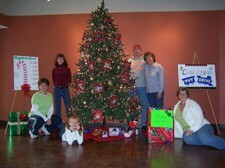 On Sunday we had collected about 3,200 toys. Our goal is 6,000. I'm hoping we get to at least 5,000. We've had lots of people step up in the past few days and we have another day before we set up the mart. So, what's your prediction? How many do you think we'll end up with? We always ask the team of planners for the event (which is 40 people this year) to make their prediction and then we give the person who is closest a funny toy that Event Planner extraordinaire, Beth, so creatively picks out every year. So, let's have our own little competition here. Post your prediction in a comment. Given that Starbucks is donating coffee and snacks for 550 volunteers on Saturday and providing a team of volunteers to help that day, I"ll support them by sending a Starbucks gift card to the person who comes closest to the actual number--which we will know on Friday night. Good News: The weather held out for our East Aurora Toy Collectioin this weekend! Good News: With toy and cash donations, we are up to about 3,200 toys. 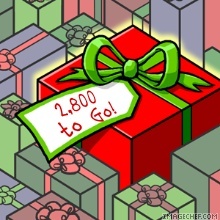 Bad News: We still need 2,800 more in order to meet our goal of 6,000. GREAT NEWS: You can still bring your money or toys to the Naperville Yellow Box until Wednesday! We started our toy collection for our East Aurora Christmas Gift Mart this weekend. Between toys and cash donations, we are at about 1,100 toys--4,900 short of our 6,000 goal. Our second weekend is always our big weekend, and we had a great generosity challenge in the message, so we aren't giving up hope that we will come close to our goal. But, we do have a long ways to go, so if you attend CCC, don't forget to bring those toys next weekend! On a more positive note, we are only about 80 people from our goal of 500 volunteers! So, if you want to join in the fun on December 15th, contact Beth today! It's been an exciting week! First after meeting with the principal and Parent Liaison at Bardwell Elementary, we've decided to start our Parent Mentor program there in January with 5 parents. So, Parents United in Action is going multi-site in East Aurora! And I couldn't be more jazzed about this other new initiative . . .in March, CCC will be launching it's 9th campus in Plainfield. Campus Pastor, Brady Prunty, is committed to and passionate about making sure his campus is heavily involved in service right from the start. So, he asked me what his campus might be able to do in East Aurora that would be their own initiative. I immediately thought of Waldo Middle School. I've been wanting to begin working at the junior high level since there is so much need there, and the principal at Waldo had actually approached me earlier this year about possibly partnering. So, we met with Ms. Barnes this week and she said she had really been praying about the best role for our church to play in helping them transform their school. And she said, "Our students need help learning, but even more than that, they need help learning how to behave appropriately." Physical aggression and defiance are two of the biggest problems the school faces, and she thought what better group to help teach character issues than a church! The school uses the PBIS system of behavioral management and our new Plainfield Campus is going to be working with staff and student leaders at the school to devise creative ways of teaching the PBIS "Cool Tools" of appropriate behavior . . . drama, video, all the stuff CCC does so well! They will also be planning incentives to help motivate students to maintain appropriate behavior. Brad has worked with Junior High kids at CCC for the past several years, so he is totally "in the know" about what excites and motivates that age student. And Sandy Rosen will be serving as our Plainfield Community 4:12 rep, and she is a phenomenal planner and coordinator, so I just can't wait to see what this partnership is going to do. We have 18 months before my oldest son will be heading off to Waldo, so I am praying for some serious transformation to happen in the next year. And if anyone can help make that happen, it is Brad and his team!